They are well written by outstanding authors. They have depth and insight designed to change your life. This. A Vampire Cure for Forever. At first glance, This. is a thrilling YA vampire book. Published summer 2010, it’s busy collecting rave reviews all around the web for its depth of characterization, surprising and engaging plot, and fresh look at vampires that readers find themselves relating to. Between all that, however, readers also receive thought-provoking commentary on identity, facing fears, loyalty, power, and the ongoing moment of eternity. FOR A LIMITED TIME: you can read most of This. online for free at ThisVampire.com/readthis. Courage, Love & the Meaning of Christmas is the major revision of the very popular Gone but not Forgotten which spent two years in Amazon’s top 200 rankings. Spencer Cook is searching for the meaning of life. Despite his shyness, he has just enough courage to act on each clue which carries him closer to the answers he seeks. These lessons are anything but academic as his quest points him face to face with his fears in several surprising ways. In the end, he learns and grows far more than he ever expected. But he still doesn’t know everything, and the subtle changes he undergoes throws him into many more plot twists in the sequel, The Perfect Gift. An American in China: Starting Over. Shaun Roundy left in March for a spontaneous six-month voyage through the Orient. Six months later, he didn’t return. What did he expect to find by leaving everything behind? Katie began working her way into Shaun’s heart in the weeks before he left, but she couldn’t hold him back. Would she ever hold him again? This true story details a search for the significant questions of life that must preceed any meaningful answers. A search through beauty and love and adventure and loss for the wisdom to know when to hold on and when to let go. Sometimes you must stare into the jaws of death to fully appreciate life. Unwilling to resist the siren song of first-hand experience, Shaun’s journey carries him into the salt spray of dangerously high seas, through frothy, typhoon-swollen rivers, and below shattered, crumbling mountainsides that come crashing down around his feet. Passion for living offered no alternatives. This journey carries him on motorcycles through crowded city streets and wide-open tropical island beaches, on trains rolling for days across the world’s most populous country, starting over again and again and again, discovering what it truly means to live, and what living truly costs. Shaun’s engaging writing style will pull you straight into living the adventure yourself. Gather a lifetime of experience in 168 action-packed, heavily illustrated pages. Sometimes it takes a journey of 20,000 miles to finally arrive at one’s own heart. Find your ticket to the journey inside An American in China: starting over. 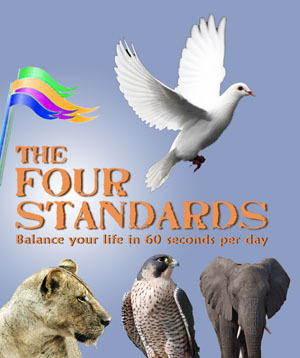 1 Step Closer to Clarity : Balancing Act: Achieving Balance, Peace and Joy the Simple & Easy Way is out of print and may be published at a later date under the title The Four Standards: Balance your life in 60 seconds per day. Shuan – on your web page http://uoflife.com/hac/pulhapanzak.htm, you state that “The river that drops over Pulhapansak (sic) Falls is born not far away, bubbling from the ground as one of many drains from Lake Yojoa, which has no natural surface exits….” Can’t happen unless the Falls source defies the laws of physics – Pulhapanzak (not Pulhapansak) Falls is at least 250′ higher than the “mean” surface level of Lago Yojoa; this means the source for the Falls may be even higher in elevation than the Falls. Lago Yojoa = 1093′ above mean sea level. Pulhapanzak Falls = 2,254+- above mean sea level. There are many surface exits for Lago Yojoa – check the river at the southern end for one example plus the marshy lacustrine overflow area in this same location (elevation 2107′ amsl). Source – Google Earth. Pulhapanzak is feed by the Rio Lindo. Source: http://yojoa.org/drupal/book/export/html/49. If I am incorrect, please let me know.